2 iBobber Wireless Bluetooth Smart Fish Finder for iOS and Android devices. Kayaks have become dramatically popular in the past ten years, making them a necessity for anyone who loves spending time on the water. But what happens when one is both a kayaking and fishing enthusiast? Is it possible to enjoy kayaking and haul in the big fish at the same time? Hell yes! You just need to outfit the kayak into an efficient fishing machine. This includes choosing the best kayak fish finder, which requires different considerations from that of a boat. Keep reading to learn more our recommendations for best kayak fish finders. 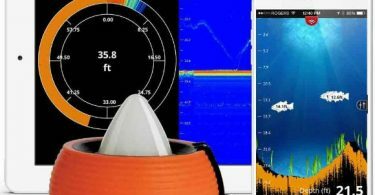 The Deeper Sonar Smart Pro Fish Finder is a Wi-Fi connected wireless, castable, portable fish finder that is compatible with Android and iOS mobile devices. It is a sphere-shaped unit and at 100 grams, it is light enough to cast with most fishing rods. It has superior scanning capabilities with a depth range of 260 feet and wireless connection range of 330 feet. The sonar relays instant detailed information about underwater structures, bottom contour, depth, fish location, underwater vegetation and water temperature. It also offers the ability to create bathymetric maps of the local waters with the Boat mode. A narrow beam of 15 degrees along with 0.5” target separation provides an excellent setup for ice fishing. The unit has a Zoom function that helps your track your jig. The ice fishing mode includes a zoom function and traditional flasher display. The iBobber wireless Bluetooth Smart Fish Finder from ReelSonar also functions as a weather station, waterbed mapper, GPS tagger and trip logger. It works in conjunction with a smartphone app that offers access to nifty features like a fish alarm and LED beacon for nighttime fishing. The app relays information about your location, water temperature, moon phase, humidity, wind speed and direction, weather report and more to your smartphone. It is shipped with a USB charging stand and a light carrying pouch. The unit uses patented sonar fish identifier technology that offers accurate readings up to a depth of 135 feet. The Bluetooth Smart syncs up to a maximum distance of 100 feet for optimized performance. You have the freedom to choose either raw sonar or fish tagging views, and the device is compatible with Google Watch and iWatch. The Deeper Sonar Smart Pro+ uses a Wi-Fi connection to relay data to your smartphone and is portable enough to fit in a backpack. It has a wireless connection range of 330 feet, which allows you to collect accurate data further from the shore. It boasts a GPS enabled mode that provides advanced mapping options, including the ability to create bathymetric maps in real time. The superior casting scanning frequencies allow you to identify fast moving fishes and measure the smallest objects. It can scan wide areas to a maximum depth of 260 feet. We love the color screen mode as it enables anglers to choose a heightened color palette depending on the time of the day for improved visibility. Whether you are a fan of boat, ice, kayak or shore fishing, you will find the Smart Pro Plus a great investment. The Garmin 010-01807-00 Striker 5cv features two types of sonars i.e. 2D Chirp and ClearVu. The 2D Chirp sonar sends a continuous stream of frequencies to provide more information and is capable of creating crisper arches with better target separation. It uses the ClearVu sonar to provide near photographic representations of underwater structures, objects, and fish. The included CV20-TM transducer covers 77/200 kHz frequencies for 2D Chirp and 455/800 kHz for the ClearVu. Also notable is that the transducer is fitted with a temperature sensor and 20 feet of cable. This unit has a depth capability of 1750 feet in freshwater and 830 feet in saltwater, which is more than one could hope for at the price range. While it lacks Sonar Recording Sonar Rewind, it offers multiple functions that will prove useful in different situations. The Humminbird Helix 5 is an excellent fish finder suitable for beginners and amateurs. It offers user-friendly features to make your fishing experience more enjoyable. Highlights include UniMap Cartography, which covers the coastline of the United State. It comes with an upgradeable software that allows staying on top of your game even with changing fishing conditions. The unit utilizes a dual beam sonar system that includes a wider 60-degree beam for covering larger areas and a narrow 20-degree beam for precise searches. It is fitted with an XNT 9 20 T transducer that covers 200/83 kHz frequencies. The Lucky FF1108 is a great choice for someone looking to have an enjoyable fishing experience. It comes with a 2.4” TFT color LCD screen that displays information about fish size, fish depth, underwater contour, water depth and water temperature relayed by the sonar. You can opt to use the fish finder in simulation mode. It has a sonar sensor with a fish-attracting lamp that makes it easier to detect fish. The transparent replacement cover enables anglers to see where the sensor is in low-light conditions. It supports a wireless operating range of 196 feet and depth detection of 147 feet. Some useful and adjustable functions offered by this unit include detecting sensitivity, depth alarm, units alter, multiple languages, depth range, zoom, and screen brightness. The Venterior Portable Fish Finder is an affordable product with features you'd expect to find on pricier models. It allows you to know important information about the depth of water, location of fish, underwater structures and bottom contour. The unit is capable of scanning to a depth range of 3-328 feet. It uses a round transducer with a 25-foot cable and removable transducer float. You can use it for any kind of fishing, including ice and shore fishing. There are multiple settings you'll find useful like a battery saving mode, fish alarm, interchangeable units of measure, backlight mode and 5 different sensitivity settings. It offers a wide range of depths to work with, allowing you to fish in different places. The Lucky FF718 is a portable kayak fish finder that boasts really nifty features including a large adjustable dot matrix for high contrast display. The sonar operates within a 125 kHz frequency and has a wireless sensor that covers a 90-degree beam angle. It also covers a 45-degree beam angle of 200 kHz frequency. A major bonus is that this fish finder is wireless and all you have to do is deploy the transducer. It has a wireless operating range of 328 feet and is powered by 3.7-volt rechargeable batteries. As for the available functions, you get user selectable sensitivity, units, fish alarm, chart speed setting, zoom, shallow alarm and more. The built-in memory stores sonar setting when you turn off the device and the wireless sensor turns on automatically when it comes into contact with water. This fish finder has an operational temperature range of -10 to 50 degrees Celsius. The Garmin Striker 4 is an excellent portable kit for beginners who love kayaking. It offers a good underwater view with a 1-foot coverage for every 3 feet of depth. It comes with a wide 3.5" screen with easy to read fonts and color that adjusts depending on the time of day for better visibility. Also included is a simple keypad interface that features dedicated buttons for convenience. The built-in flasher makes this unit ideal for vertical jigging and ice fishing. The Lowrance Hook-4 Mid/High Ice Machine Fish Finder is great for freshwater fishing, ice fishing and saltwater fishing in kayaks. 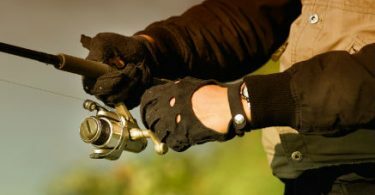 It offers a wide range of features to make your fishing trip a memorable experience. Highlights include a 2.8-inch high-resolution screen with a bright color display for the perfect images. The device is water resistant so you don't have to worry about damage due to water exposure. It has a TrackBack feature that allows you to view a past sonar reading as well as a return to fishing hotspots. An Advanced Signal Processing feature helps you view fish more easily. It works by allowing the unit to scan in a high range, middle range or DownScan. The device has a high power output to ensure detailed feedback and supports up to 30 languages. Use of kayak fish finders has become popular among anglers, many of whom have benefited from the nifty devices. The main challenge that arises has to do with choosing a good unit that offers lasting reliability. This section discusses important factors to consider when shopping for a kayak fish finder. The screen resolution is the most important factor to consider when it comes to choosing a kayak fish finder. Go for a screen with a larger resolution or the highest number of pixels you can afford. 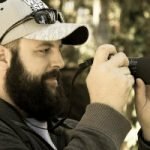 It will help you see clearer and more detailed images. Whatever you choose, make sure the screen resolution is not less than 240x160 pixels or higher than 640x640 pixels. In the past few years, kayak manufacturers have teamed up with fish finder brands to make scupper holes that match transducers. This allows for a stress-free installation and is something you will have to consider. For instance, Necky, Old Town, and Ocean Kayaks are owned by Johnson Outdoors. This is a brand that exclusively designs scupper holes for Hummingbird transducers. 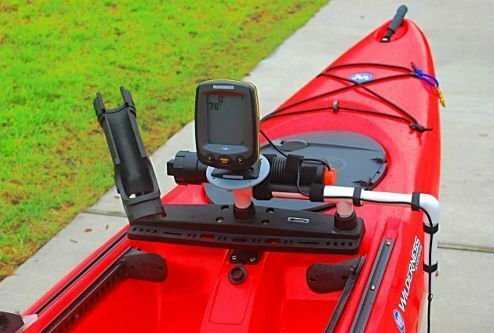 Hobie and Wilderness Systems kayaks come with Lowrance compatible mounting features. The next thing you have to think about is the amount of mounting space available on your kayak. You will need space for the cables, small 12V battery, and charger, rods, tackle as well as a RAM or Scotty fish finder. The fish finder should have a large enough screen to view detail yet compact enough to not be in the way when casting or paddling. This is calculated using units of wattage and the higher the number of watts, the more powerful it is. Higher power allows a unit to display clearer images more quickly. Sonar wave speed depends on a unit’s power. If the power is low, then the sonar speed will be slow and the displayed image blurry. The cone angle determines the width of the beam transmitted through the water by the transducer. A wider cone angle allows the transducer to cover a wider area. However, it's important to note that the image starts to diminish if the cone angle is too wide and waves too spread.